This is the Irish Banner from Dreaming Tree. The Cricut cuts are the banner (Bits & Pieces) and the sentiment (Art Nouveau font). That's whats fun about Leo's SVG's, you can add cuts from your Cricut to personalize your project. I used solid green papers from the Recollections Green stack, and the rest is out of my stash. I actually made a grid to put lime Stickles on the clovers to mimic a manufactured paper. This is on my craft room door. I've always wanted a St. Patricks decoration, and now I have one! This is so pretty!! I love all the sparkle!! This is Super Michelle I love it, I think we were both on the same wave length- It was a lot easier than I thought it would be. 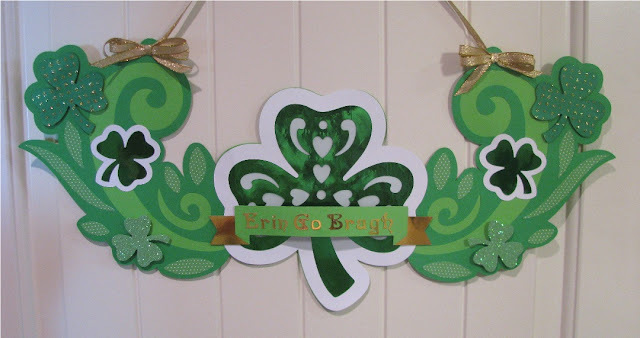 What a pretty St. Patrick's Day decoration for your craft room door! I love the gold ribbon and the glitter! This is such a wonderful decoration for your craft room! Love the way you incorporated the cricut cuts! I love this wall decor for St. Patrick's day. The sentiment is perfect too. Nice job, Michelle! Great banner / sign you made for the Fantabulous Cricut challenge Blog. WOW! This is just beautiful!! Love the gold ribbon!